After a lovely Bank Holiday Monday which included eating ice creams at the seaside and a family badminton tournament in the garden, I decided to make a corned beef and potato pie for tea. I cheated a little bit and used a packet of shortcrust pastry mix that I just had to add some water to because I’d much rather be outside having fun with the kids than making pastry! Peeled and chop four large potatoes and boil them until they’re soft. Mash the boiled potatoes with a tin of corned beef . Roll out half of your pastry on a floured surface and us it to line you pie dish. 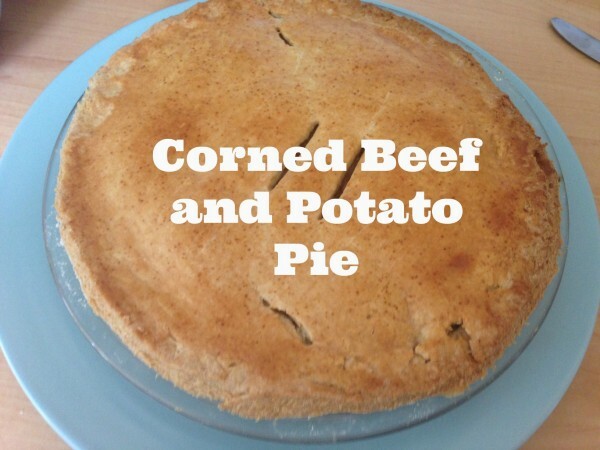 Fill your pie with the corned beef mix and then roll out the other half of the pastry and use that as a lid. Wash the top of the pie with a beaten egg or some milk and use a fork to pop a hole in the top for the steam to escape from. Bake for 20 – 30 minutes at around 200 c.
Previous Post What we’re eating tonight – Hunters Chicken…. Next Post #WhatsForTeaTonight – Pulled pork sandwiches and homemade coleslaw….